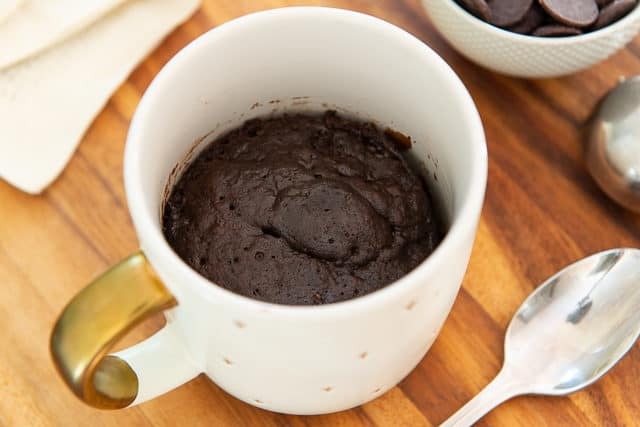 Chocolate Mug Cake - Moist and *actually* tastes good! 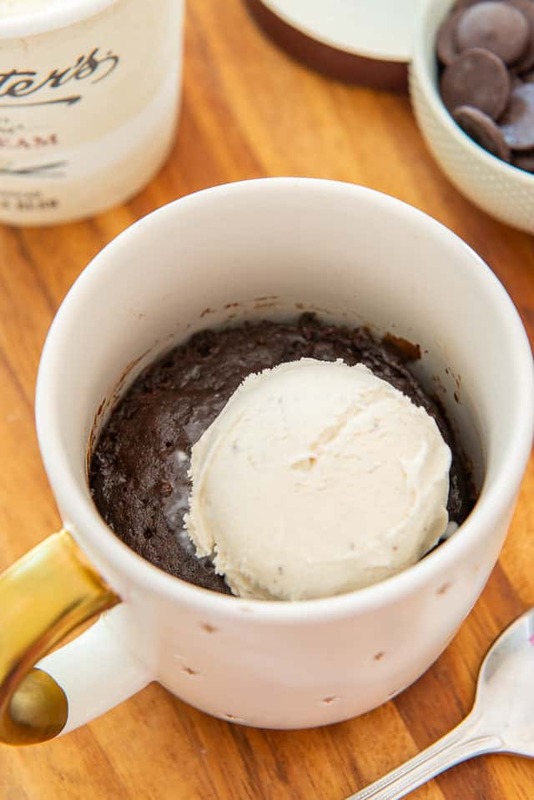 This Chocolate Mug Cake recipe is the first one I’ve tried that actually tastes good. 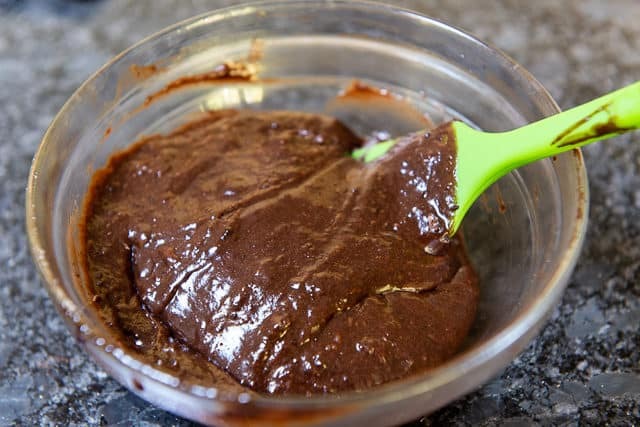 It’s cooked in the microwave for a quick chocolate treat serving one or two people! I remember when mug cakes blew up on the internet many years ago, I got really excited. Having just a little mug portion of cake ready in five minutes sounded so wonderful. I tried several of the mug cakes floating around the internet, and oh boy, I was always disappointed. Yes, making a mug cake in 5 minutes is easier than making a real cake, but if the mug cakes weren’t even going to taste good, why bother? When I saw that Cook’s Illustrated published a recipe for Chocolate Mug Cake, I decided to try it. 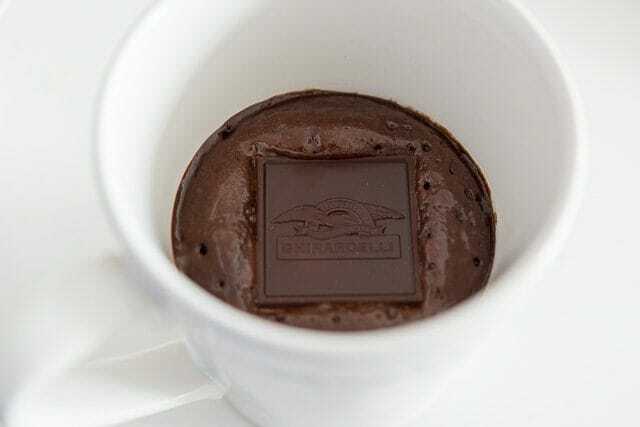 I know they test things many times and if there was a reliable mug cake recipe out there, this would be the one. And yes, it was actually good! Finally! One thing I’ll note is that you use a couple of small bowls here and mix things together separately (as contrasted to some recipes where you dump everything into the mug and simply mix it together). 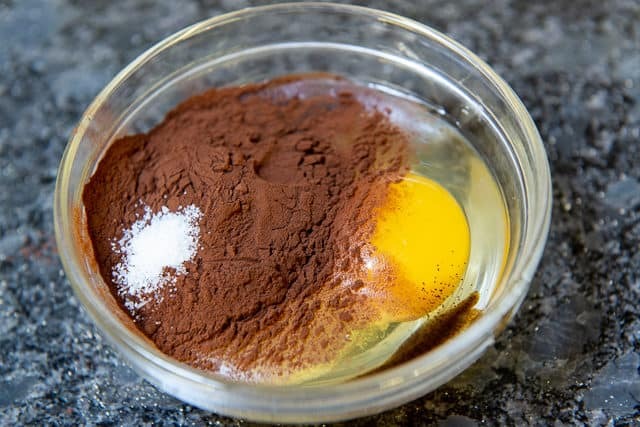 I get that the dump and mix method is easier, but since I care about how good the end result it is, it’s worth the effort to mix the wet ingredients together, then add the dry, etc etc. It makes a big difference in the overall texture of the cake. 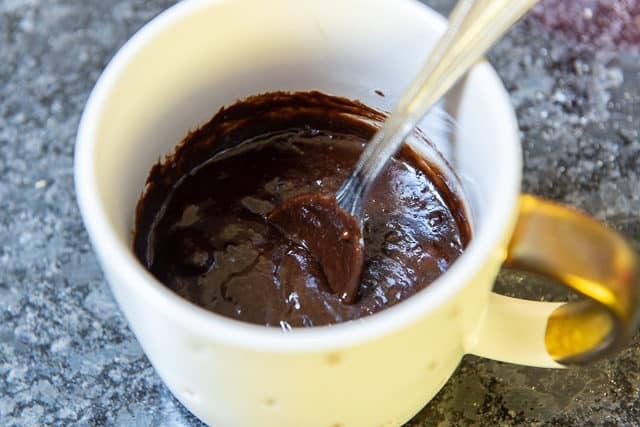 The trick with mug cakes is to stop cooking the cake earlier than you think, because you want it to be on the gooey side, and the cake will also continue to cook as it cools. In the original Cook’s Illustrated recipe they press a piece of chocolate into the top of the cake, however I’ve found that I prefer not to have melted chocolate intermixed with the cake, and putting the square on top makes it harder to tell what the doneness is in the middle. So I skip it. But know that you can do this if you’d like, and I’ve included these instructions in the recipe box. One thing that I do find completely necessary though is a scoop of vanilla ice cream. The cake is pretty good for a quick fix, but I haven’t found any mug cake to be good enough to stand on its own. The cool and creamy ice cream contrasting with the warm chocolate cake is essential. I’ve got the full recipe below, plus an instructional video below the recipe card if you’d like more guidance. Hot Chocolate from Scratch, Chocolate Crinkle Cookies, and Chocolate Peanut Butter Cupcakes are some of my other favorite chocolate desserts. Enjoy! Note: I have had great success making this for both one and two people. The serving size in the recipe box is for two, but feel free to only do one. However, see the recipe notes about reducing cook time slightly. You want to make sure not to overcook the cakes! 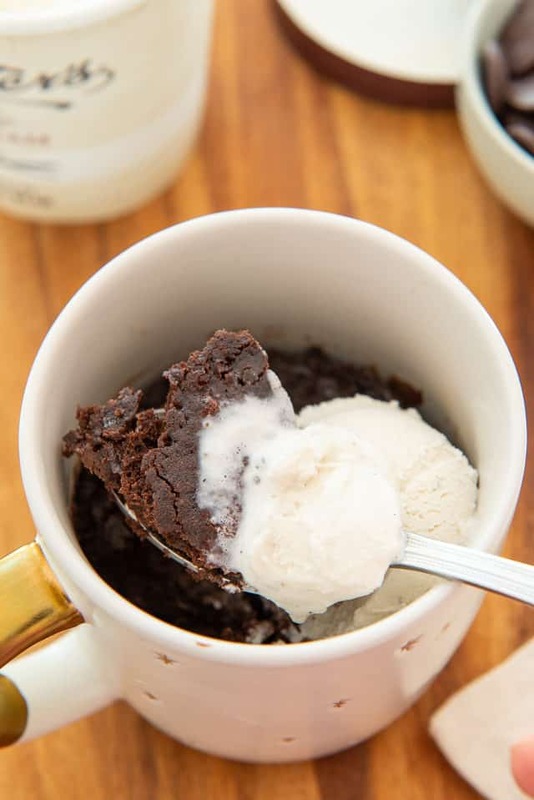 This chocolate mug cake recipe is the first one I've tried that is ACTUALLY good. It's cooked in the microwave for a quick chocolate treat! Select two mugs that hold at least 11oz of liquid in them (about a cup and a half). 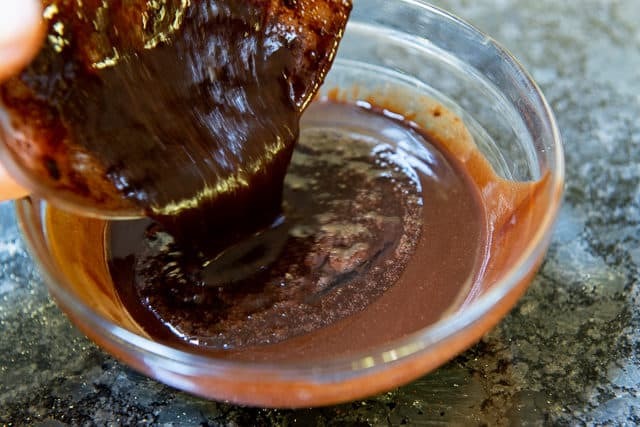 Microwave the butter and chopped bittersweet chocolate in a large bowl for about 1 minute, stirring halfway through, until fully melted. Set aside. 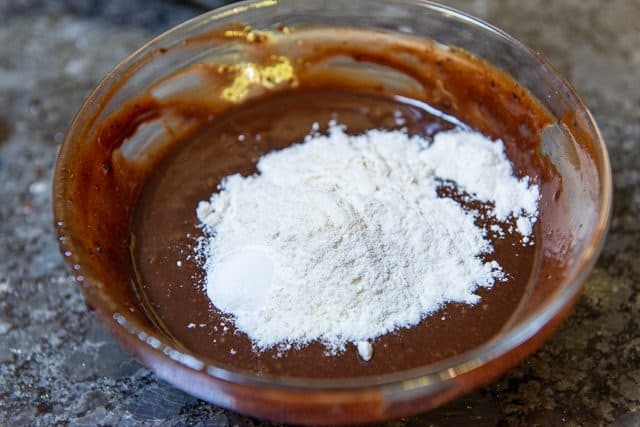 Whisk the sugar, eggs, cocoa powder, vanilla, and salt in a medium bowl, then whisk this into the melted butter and chocolate. Whisk in the flour and baking powder, then evenly divide the batter between the two mugs. Put the mugs on opposite sides of the microwave turntable, and microwave at 50% power for 45 seconds. 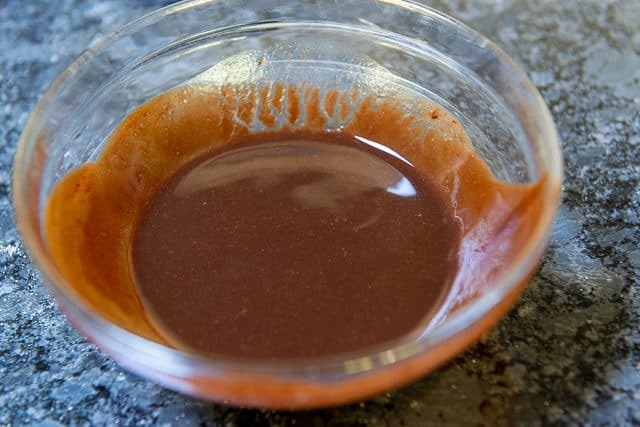 Stir the batter well with a spoon, then microwave for another 45 seconds at 50% power. If you're adding extra chocolate to the tops of the cake (see recipe notes), now is the time to press one square into the top of each cake. As stated in the blog post, I personally don't add extra chocolate. Microwave for an additional 35 seconds at 50% power. At this point the cake should still be a little gooey on top, but you can check that the interior of the cake should be around 200 degrees F. Let the cakes sit for 2 minutes while the heat continues to cook the cakes slightly, then serve with vanilla ice cream. Enjoy! This recipe was developed for a full-size, 1200-watt microwave, according to Cook’s Illustrated (as stated above, this recipe is adapted from their issue published in 2013). This is the vanilla paste I use now instead of vanilla extract. I love the little vanilla bean specks! 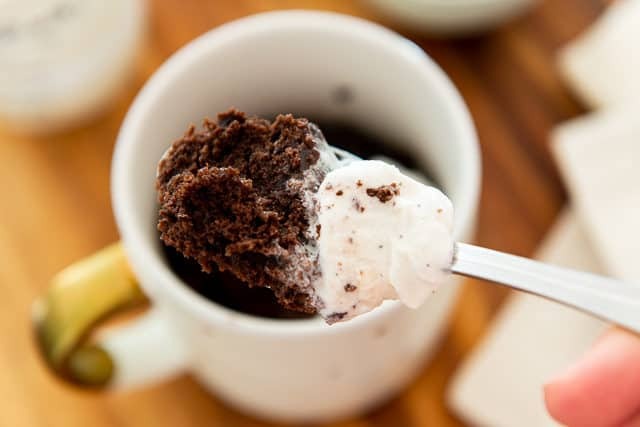 *If you wish, you may add two 1/2 oz pieces of bittersweet chocolate to press into the tops of the mug cake. If only cooking one mug cake, you may need to reduce the cook time slightly. 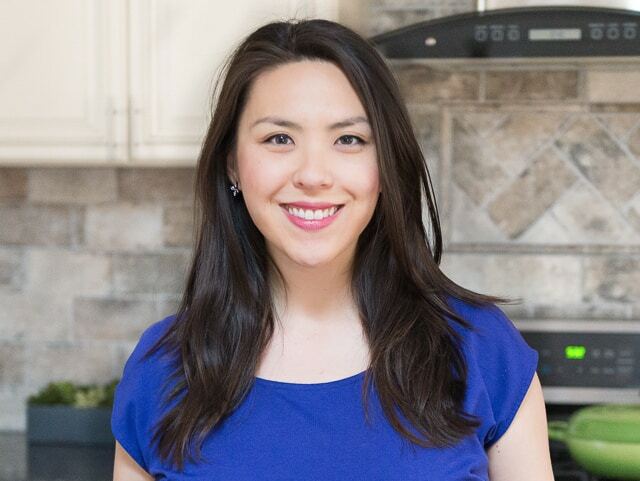 Try reducing to three 30-second intervals, keeping your eye on the cake. Be careful not to overcook. Post updated in January 2019. Originally posted April 2015. This looks so good! I also hate making a whole cake for just the three of us because we would eat the whole thing way too fast! YUM! I have always wanted to make these (also for a house of two). Thank you, Joanne! Oh, this looks amazing. I love that it’s made from scratch and not from a mix…and that square of chocolate…WOW. That looks awesome! 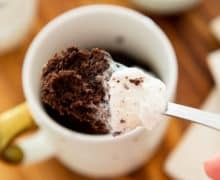 I have to agree, putting melted chocolate and lots of buttah (or coconut oil) in a mug cake makes it better 🙂 This cook’s illustrated variation sounds terrific!